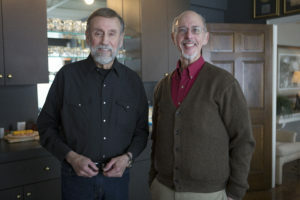 I had a lot of fun interviewing country music and comedy legend Ray Stevens for the Ledger about his new Ray Stevens CabaRay Showroom, which will be the first major entertainment complex in the Bellevue suburb located on the west side of Nashville. Ray has a great sense of humor – obviously – and was very easy to talk to as he gave me and Ledger photographer Michelle Morrow a nickel tour of the construction site in mid-March. The package of articles are in the March 31-April 7 print edition of the Nashville business weekly, and you can pick up a copy at one of these locations. Or it can be read online at westviewonline.com. You can also read more in the right-hand column on this page. The multi-million-dollar CabaRay Showroom will be opening in late summer, likely August. A bright red piano sits in the back corner of the stage, awaiting its master. Three beautiful background singers stand behind their microphones, the picture of harmony. Members of the house band — dressed in matching black tuxedos — are poised to play. The golden-throated announcer, wearing a white tux jacket, smiles and steps to his mic. It’s like I’ve traveled back in time and am in Las Vegas, attending a show in the Celebrity Room at the Desert Inn. 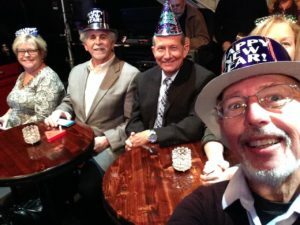 In reality, I’m sitting at a cramped table with friends at a Music Row studio for a taping of Ray Stevens CabaRay Nashville, a half-hour, syndicated television show that airs on PBS stations across the country, including WNPT on Saturdays at 6:30 p.m.
Three, two, one. Lights, camera, action! “From the Ray Stevens studios in the heart of Music Row in Music City USA, welcome to …,” says announcer Bill Cody, who is better known as WSM Radio’s Disc Jockey Hall of Fame morning personality. 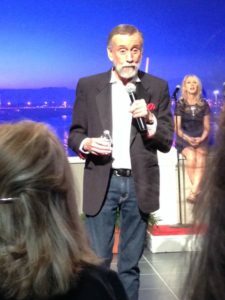 And then bouncing onto the stage is our host for the evening, Ray Stevens, who flawlessly launches into one of his classic country comedy songs, tells a joke or two and takes command of his audience. And while the Ray Stevens CabaRay Nashville show and the set definitely have that old-school Las Vegas feel of that Celebrity Room where Stevens used to perform, this is all Nashville glitz and glamor. The show is a light-hearted, nostalgic mash-up of Stevens’ music and comedy along mixed in with interviews and performances by big-name Music City guests. His season one guests included the likes of Steve Wariner, Larry Gatlin, Bobby Bare, Tanya Tucker and Don Schlitz, among others. Two seasons’ worth of shows were taped at Stevens’ Music Row studios (I attended one with friends in December), but production will move to Bellevue after his CabaRay Showroom opens in late summer. The vastly larger venue will allow more people to attend and improve production quality for the show, which in turn will help bring tourists to Nashville to see a full-scale live show. UPCOMING EVENTS: As spring arrives in full bloom, there are always several events I like to attend. 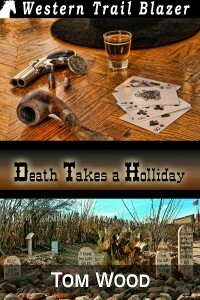 I was excited to receive notification the other day that my short screenplay “Death Takes a Holliday” was named a semifinalist in two categories of the 2017 Nashville Film Festival. Unfortunately, I didn’t make the top three finals in either category, but I will take semifinalist recognition any day. There were over 1,300 entries in the Festival’s screenwriting competition. 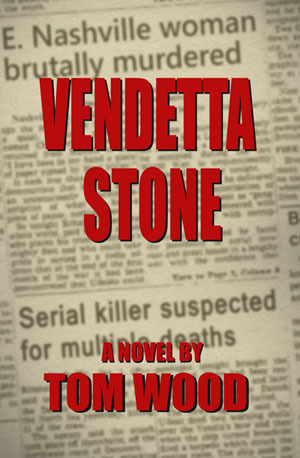 If the name of my screenplay sounds familiar, it should. I wrote a short story a few years ago and it was published in Weird Western Yarns (sorry, it’s now out of print; to the left was the ebook cover). Everyone said it would make a great movie, so I did the screenplay and sent it in last June. Perhaps you’ll be able to see it on screen someday. This year’s Nashville Film Festival will take place April 20-29 at both Regal Hollywood 27 at 100 Oaks Mall after a long stint at Regal’s Green Hills Cinema. The new venue should bring even greater exposure to on of the city’s premier cinematic events. Another major event is the Franklin Main Street Festival, where I will be manning a booth with other local authors including Bill Peach, Michael J. Tucker, Kathy Rhodes, Joseph Clay, Mike Tucker, Tim & Debbie Bishop, Bill Holley, D. G. Driver, Reba Stanley, Pattie J. Keith and Louise Colln. It takes place April 29-30 in Franklin Please stop and say hello, and support local authors.